Directions for Candied Kumquats: Combine water and sugar in medium saucepan. Scrape in seeds from vanilla bean; add bean. Stir over medium heat until sugar dissolves. Add kumquats; reduce heat. Simmer until kumquat slices are translucent, about 25 minutes. Remove from heat; cool kumquats in syrup. Strain kumquats, reserving syrup. Combine kumquats and 1/4 cup syrup in small bowl. Return remaining syrup to same saucepan; boil until reduced to 1 and 1/4 cups, about 8 minutes. Directions for Crust: Position rack in center of oven and preheat to 350° F. Combine cookie crumbs and brown sugar in medium bowl; add melted butter and stir until crumbs feel moist when pressed together with fingertips. Press crumb mixture evenly onto bottom and 1 inch up sides of 9-inch-diameter springform pan with 2 and 3/4-inch-high sides. Bake crust until set and edges are golden brown, about 20 minutes. Cool crust in pan on rack. Maintain oven temperature. Wrap 4 layers of heavy-duty foil tightly around outside of pan with crust to make pan waterproof. Meanwhile, using electric mixer, beat cream cheese and remaining 3/4 cup sugar in large bowl until smooth. Mix in sour cream, flour, and salt. Beat in eggs 1 at a time. Mix in cooled orange juice mixture. Pour filling into crust; place springform pan in large roasting pan. Pour enough hot water into roasting pan to come halfway up sides ofspringform pan. Bake cake until just set in center, about 1 hour and 35 minutes. Remove cake from roasting pan; remove foil. Place cake directly in refrigerator and chill overnight. 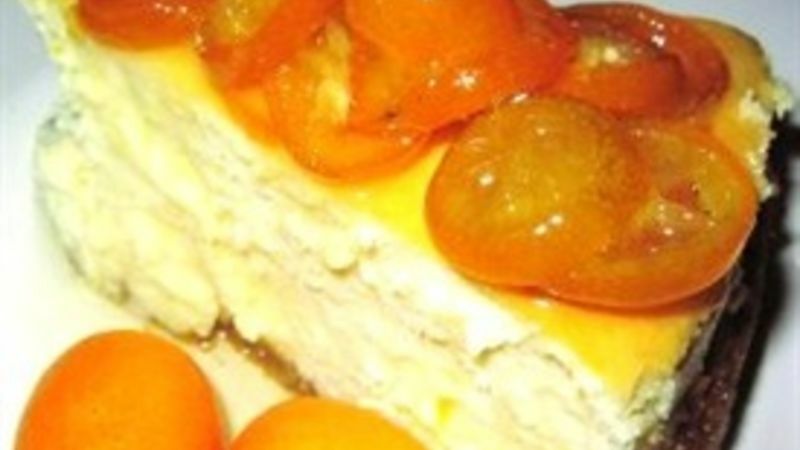 Arrange kumquat slices atop cake, covering completely. Remove pan sides; place cake on platter. Cut cake into wedges; drizzle with some kumquat syrup over and serve. The kumquat syrup is perfect with the cake. But don't stop there. It's also yummy drizzled over vanilla ice cream or in a cup of tea, a glass of club soda, or even a vodka Martini.